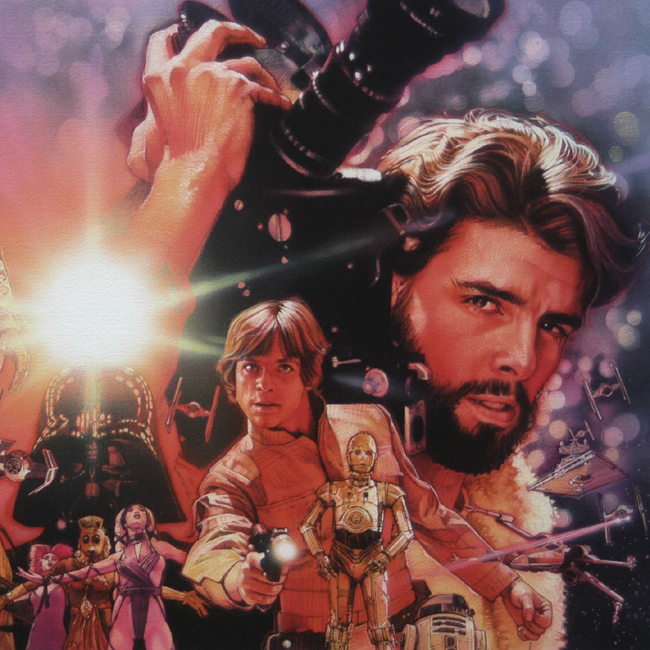 This limited edition print is of the artwork drew painted for the cover of the revised and updated book of Charles Champlin's insightful study of George Lucas. The book brings the story of this remarkable man and his innovative empire up to the present as of 1996. This Giclee limited edition print features a portrait of the young George surrounded by all the dreams he made come true from out of his imagination and into our hearts, lives, and pop culture. This is not only a fine museum quality archival print but is very special in that it is hand numbered and signed by drew and by George Lucas himself. George only vary rarely signs his autograph and with it on this outstanding art print it becomes exceptional and as well as rare.